The genus Ornithogalum is called sun star or wonder star, and yields over 120 different species of flowers, mostly originating in South Africa and the Mediterranean. Ornithogalum is a member of the Hyacinthaceae or hyacinth family. Something to keep in mind is that the bulbs of Ornithogalum plants are poisonous, and should not be mistakenly planted in place of the similar-looking wild garlic. Star-of-Bethlehem is the common name of Ornithogalum umbellatum, which some now call a weed because it grows commonly in the north American landscape. It is native to the Mediterranean basin. 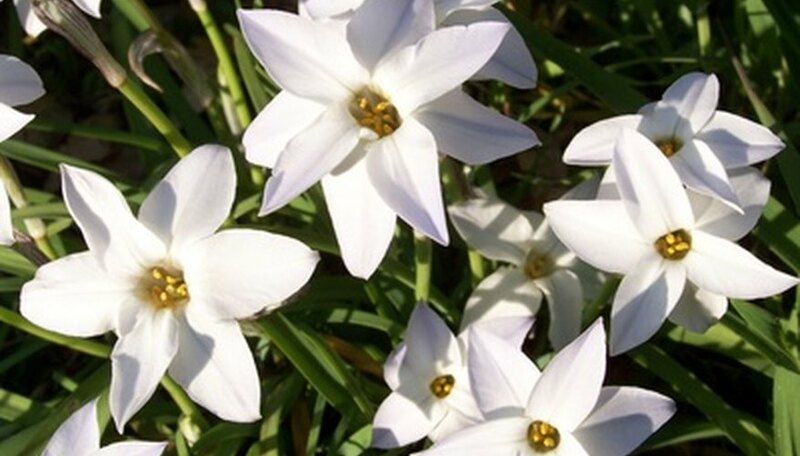 Star-of-Bethlehem reproduces from bulbs and exhibits pretty, star-like, six-petal white flowers that appear at the ends of leafless, flowering stems. The plant also has shiny green leaves that are fairly long, usually between 4 and 12 inches. At first glance, it is easy to confuse the leaves of the Star-of-Bethlehem with the leaves of the wild garlic plant, as many people do. However, Star-of-Bethlehem leaves have a silvery-white median stripe marking that distinguishes them. Another interesting sun star species is Ornithogalum magnum, whose flowering stems can reach up to 3 feet in height, blooming profusely with pretty white flowers for several weeks during May and June. Ornithogalum dubium is called the snake flower. Its large blooms are also six-petaled but they are orange or yellow in color, sometimes with a green or brown center. The first blooms are shaped like small cups, and flatten out as the blooms begin to fade. This species is native to South Africa, and grows in mountainous areas. Ornithogalum arabicum or Arab’s eye features clusters of small white flowers on long, leafless stems. Arab’s eye is favored as a container plant, as it has a pleasant fragrance in addition to pretty flowers. Like all species of Ornithogalum, do not over water because this could cause the bulb to rot. Ornithogalum arabicum enjoys direct sunlight. Cosset this plant, protecting it from wind and cold. Remember that it is native to the hot climate of South Africa and cannot deal with frost. What Are Common Colors for an Amaryllis Flower?